The BA Francophone Library, in cooperation with the BA Legal Departement, organizes this event to celebrate the World Book and Copyright Day, and the World Intellectual Property Day. 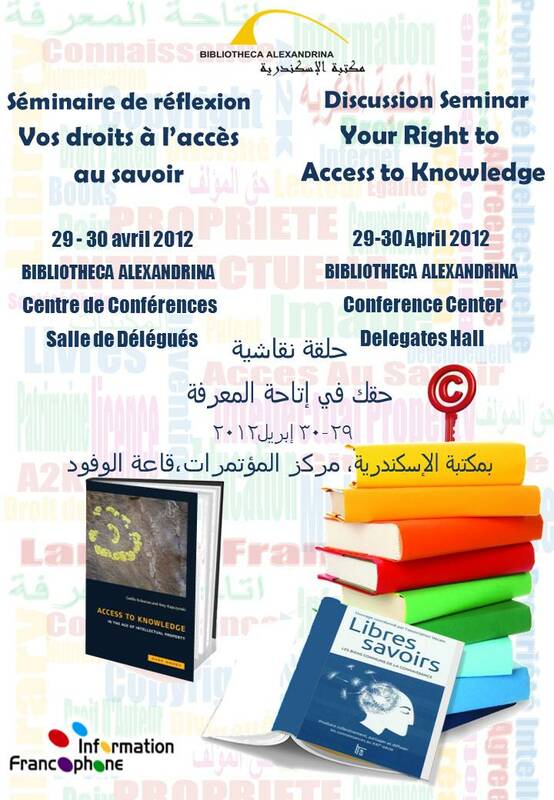 In celebration of the World Book and Copyright Day & world Intellectual Property Day The Francophone Library and the Legal Department (A2K Initiative) of the Bibliotheca Alexandrina Organized A Discussion Seminar Entitled: Your Right to Access to Knowledge (29-30 April 2012). In cooperation with TWAS-ARO, DAAD, Elsevier and the Bibliotheca Alexandrina Legal Department; the Center for Special Studies and Programs (CSSP) has continued its support for young researchers by organizing a workshop entitled Guidelines for Researchers, during the period 27-30 September 2010. This workshop aimed at helping young researchers to refine their skills in order to translate their scientific research into doable commercial ventures to meet international standards. 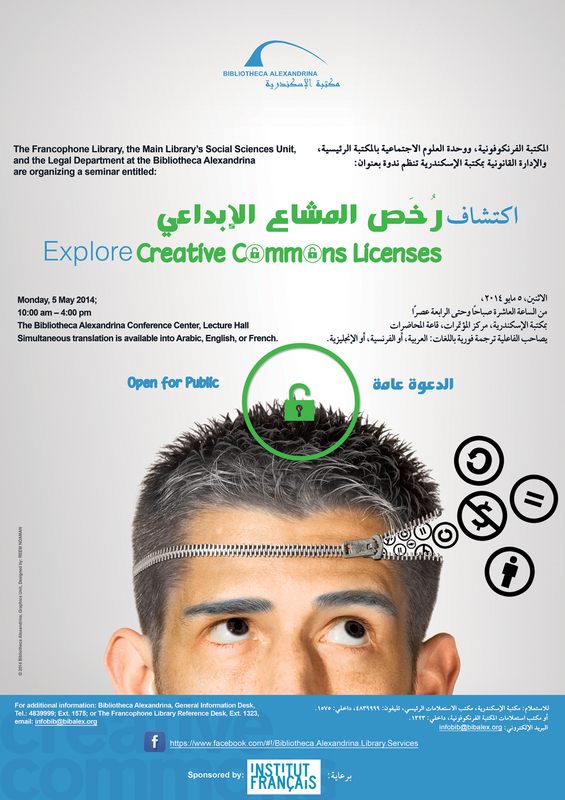 This workshop will focus on copyright issues and the new tools to access and disseminate knowledge in the Arab countries. The workshop aims to give basic information about intellectual property, focusing on the latest topics on access to health and medicine in relation to intellectual Property Rights. Speaker/trainers are Egyptians Arabs and international. The Bibliotheca Alexandrina organized a workshop entitled “Intellectual Property and the Digital Age” in the period 20-22 December 2008 . The workshop participants were of divers experiences including: lawyers, judges, district attorneys researchers, librarians and IT engineers. The workshop gave an introduction to intellectual property laws, their impact on the social and economic development, and the WIPO Development Agenda. Then the modules got in depth on copyright issues with a special focus on Creative Commons. The Bibliotheca Alexandrina organized a workshop entitled “Patent: Impact on Developing Countries” in the period 13-15 December 2008 . The workshop participants were of divers experiences including: lawyers, judges, researchers, librarians, IT engineers and scientists especially those in the pharmaceutical arena. It discussed objective requirements and the procedures to apply for a patent, the registration of a patent, both nationally and internationally, and protection under “undisclosed information”. It underlined the flexibilities in TRIPS for developing countries and the latest discussions and negotiations in the concerned international organizations in Geneva. 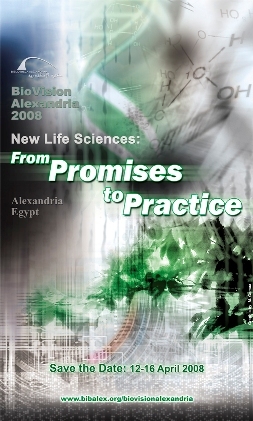 It also Highlighted the approach of Egyptian judiciary taking the pharmaceutical products cases as study cases. The Bibliotheca Alexandrina organized its fourth international biennial conference, BioVisionAlexandria 2008, held 12-16 April 2008 in Alexandria, Egypt. Funded by OSI (Open Society Institute) entitled "Intellectual property and New Tools for the Dissemination of Knowledge" in Alexandria, with a varying participants from different disciplines to disseminate the new tools for the dissemination of knowledge. Funded by OSI (Open Society Institute) entitled "Intellectual property and New Tools for the Dissemination of Knowledge" in Cairo, with a varying participants from different disciplines to disseminate the new tools for the dissemination of knowledge. New Tools for the Dissemination of Knowledge and the promotion of inovation and creativity; global developments and regional challenges. The Bibliotheca Alexandrina jointly organized a conference for Regional Arab Dialogue on Intellectual Property Rights (IPRs), Innovation and Sustainable Development, with the International Center for Trade and Sustainable Development (ICTSD) and the United Nations Conference on Trade and Development (UNCTAD).